What Happened to the 10 Neo-Pros for 2017? As well as ten riders for 2017, ten neo-pros were picked in January as ones to look out for this season. How did they fare? We didn’t have to wait for David Gaudu. The 2016 Tour de l’Avenir winner has enjoyed an excellent season. FDJ raced him sparingly and mixed his programme with Coupe de France races and World Tour events. It was when he was in with the big names that he got the best results, ninth in Flèche Wallonne (that’s him sticking it to Valverde in the image above) and seventh on the summit finish of Lo Port on the Volta a Catalunya where he in a small group with mountain royalty Valverde, Froome, Contador, Adam Yates as well as the promising Marc Soler. All this aged 20. He won a stage in the Tour de l’Ain too after a two-up breakaway with team mate Thibaut Pinot and he was fifth in Milan-Torino on the Superga finish. He’s far from the finished item but ends the year with more promise than he started. Edward Ravasi rode the Giro and finished but didn’t have a season-defining result. A strong climber – second to Gaudu in the Tour de l’Avenir – perhaps his tenth place on the mountain stage of the Tour of Croatia won him a start in the Giro where he worked for his team mates. A solid season but nothing flashy and Italian website cicloweb writes “more was expected from him this year”. Meanwhile UAE team mate Filippo Ganna had a solid season… on the track. He’s a pursuit specialist and won the European title among other indoor success and was fifth on the road in the Tour of California’s time trial stage. Vincenzo Albanese didn’t set the season alight either, a punchy uphill finisher his best result was fifth… in the U23 World Tour championships. Yes he qualifies by age but racing a developmental event seemed like a regressive step for someone who started the Giro and banked several other stage races in their legs. Bardiani-CSF may have looked appealing at the start of the year, a home team with invites galore but their double positive test on the eve of the Giro looks bad, points to their lack of resources and raises questions about invites for next year. Mads Würtz Schmidt came close to a win in the Rund um Köln where he was second and had several other high placings this year in sprints and time trials. The Katusha rider did plenty of team work and will be one to watch in 2018, does he aim for the classics or will he become a valuable lead out for Marcel Kittel because the sprinter moves teams without bringing his habitual lead out. Nans Peters (Ag2r La Mondiale) struggled with injuries and often as he resumed racing from a bout of tendinitis he seemed to be off again for injury, a problem he encountered in his last year as an amateur too. Tao Geoghegan Hart has thrived at Team Sky. Opportunities are thin at Team Sky given the team’s leaders and level of domestiques who could lead other teams but TGH grabbed his chances and had a top-10 overall in the Tour of California and was 15th overall in the Tour de Suisse. These are the kind of results that might have seen him drafted for a grand tour were he on another team. He was versatile in the U23 ranks, able to win a summit finish or place in Paris-Roubaix and showed this in races like the BinckBank Tour (ex-Eneco) where he was rubbing shoulders with the flandriens and this should count him in good stead when it comes to picking workers for an eight rider grand tour team. Enric Mas was second in a stage of the Vuelta (pictured). 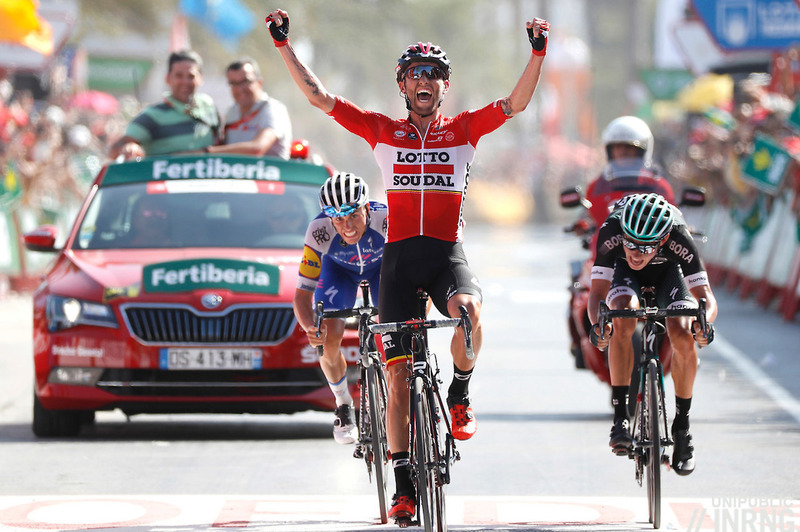 He was also second overall in the Vuelta a Burgos and no accident after after finishing third on the Picon Blanco summit finish and then second on the climb to the Lagunas de Neila. He’s even been named as Contador’s success… by Contador himself. He’s ridden for Contador’s youth team so perhaps this was more than a throwaway quote and certainly the search in Spain for new riders to replace the old guard – Rodriguez, Contador have retired, Valverde can’t for eternity – and Mas is a new name to add alongside Landa, Roson and others. The Majorcan, trained by ex-pro Toni Colom, is promising enough to have earned a contract extension already from Quick Step. Robert Power‘s been talked about in whispered tones as Australia’s next big thing but 2017 was his first year as a pro after a delayed start following a bone marrow illness and if there were no big results it was satisfying to see him bank a full season of races which should set him nicely for next year, plus Greenedge have a good record of developing riders, just see Jack Haig who seemed to go quiet after a promising debut only to have a great seasonn this year. His one top-10 was fourth in the Öztaler Pro race which may not be the biggest race on the calendar but it is the highest, at least when measured by vertical gain and Power helped set up team mate Roman Kreuziger for the win. Rémi Cavagna was often putting his power to good use for his Quick Step team mates. As time trial specialist he had a few results along the way such as a fifth place in the Tour of Belgium’s time trial stage. Off all the specialities in pro cycling such as climbing and sprinting, time trialling is probably the longest to perfect although stage racers might dispute this. Either way Cavagna’s had a promising start. Mikkel Bjerg, U23 World Champion and only 18 years old is one to watch to replace Cancellara. Don’t forget he just set the new Danish hour record and has the third fastest legal hour record at sea level due to Wiggins’s dubious handlebars 5th overall. He also was second in the chrono des nations 2nd in the u23 European itt championships and 3rd in the Danish national itt championships. I think he might be a new Tony Martin, indurain or anquetil. VO2 max is overrated as a global index of potential performance. Not only there’s much more to the sport than pure physical performance (but that’s just obvious), there’s also a big question mark about efficiency. Junior TT is very different to the u23 TT, VO2 or not. Taking the u23 at 18 years old is definitely laying down a marker. No doubt, winning one category above your age is impressive, even with every possible caveat. However, I wouldn’t agree that much about the TT being a better predictor than the RR, although the latter is, for sure, way opener to random factors. Maybe (I’d have to check in detail) the podia quality is comparable, but the RR tends to provide way better winners. Examining the winners until 2013 included (the winners of the last 4 years have had too little time to prove themselves), you can notice that two thirds of the RR winners won at least one stage in a GT, while among the TT winners the proportion is reversed. RR winners also have way better scores in GCs and in the Classics. Including the whole podia makes it hard to check everything, but TT U23 Worlds gain indeed several big names (Klöden, Rogers, Cancellara, Nibali, Kittel, on a different level maybe Dennis); yet, it’s not like the RR loses much ground (Freire, Di Luca, Degenkolb, maybe Van Summeren – and on a different level the likes of Meintjes or Betancur…). From the opposite perspective, I’d say that of the 54 or so podium spots for each category, 10-12 have been occupied by riders who then did essentially nothing on the road in the pro ranks in the case of ITT U23 Worlds, while it’s some 8-9 in the case of the corresponding RR (the figures may vary depending on what one might consider “doing anything” in the pro ranks). He’s a huge talent, Denmark seems to have a serious factory at the moment. He’s just turned 19, btw. Julius Johansen (18) also took the Junior RR, after mechanicals denied him a solid chance of the Junior TT podium. Indeed. A solid long term interest – with a good historical background of relevant names – and an all-around investment on cycling is paying serious dividends. (Well, Norway has been doing great in the under ranks for the last 5-6 years, too: it will be interesting to see if that grows in something as structured as the Danish situation. The premises look to be there). All that said, the paradoxical downside of having a great organisation promoting and training U23 talents is that many of them triumph among those of similar age precisely thanks to such factors: but such an advantage goes flatter once you’re among the pro. It’s what used to happen in many Eastern Europe countries: a great number of impressive U23 talents who many times vanished among the pros. Many fans superficially linked that to doping – but it’s far from being that simple. Better said: as in most cases, doping explains little or nothing. If one thinks about it, it’s pretty much what can also be seen in France, in the Netherlands (and in Italy, too – someway less in Spain, especially if you let País Vasco aside). Some riders win because they’ve been brought way ahead of much of their same-age competition in technical and physical terms – but often, and for that same reason, they’ve got less margin to grow further. Add to that, as Papuass wrote, the mental factor. There’s a couple of Rasmus who were going to be the next big thing… they’re still rather young and might prove a different potential in the future, but nowadays both Guldhammer and Quaade look pretty much destined to the .2 world. However, it’s way better to have a strong feeder pushing up whomever has got a pinch of talent, albeit they might eventually disappoint, than the other way around. it’s always amazing how the comments fall off in the offseason. but more to the point, I really enjoy the “neo pros to watch” pieces. not only must it be difficult to identify a variety of hopeful talent, but then to also keep an eye on them through the season. riders like gagen hart and gaudu clearly have the talent and it will be an interesting side story to follow the others as I have in years past. thanks for putting these together, it helps me sound very smart to my friends. Just try and avoid the black hole that is Italian neo-pros on Italian teams. Surely – some of them happen to find a *safer* environment elsewhere.